In Resident Evil, Tyrants are mass-produced bio-weapons. They're scary! 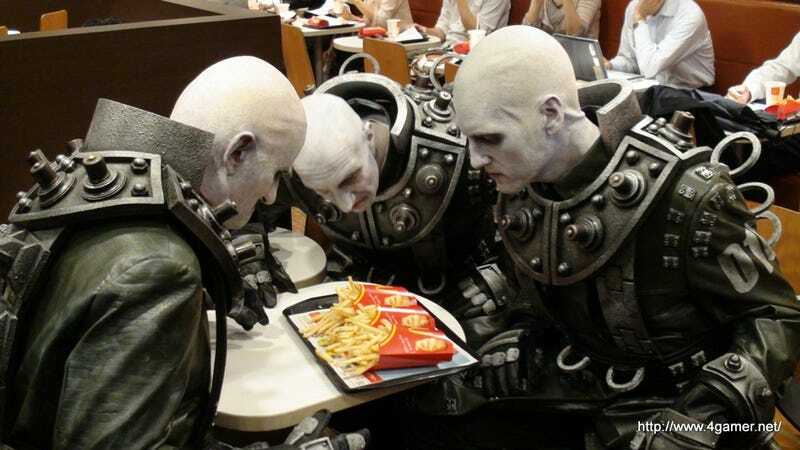 In Akihabara, they're the bald dudes staring at their fries. Which isn't so scary. It's actually kind of cute. To promote the Resident Evil CG flick Resident Evil: Damnation, a trio of T-103 Tyrants roamed the streets, rode public transportation, took escalators, posed for pictures, and glared. Lots and lots of glaring. Japanese site 4Gamer was on hand to follow the Tyrants around; check out the photos below.